WASHINGTON – An intentional and campus wide approach and a holistic evaluation of underrepresented students in the admissions process can help graduate schools cultivate a diverse and inclusive student body and produce degree-holders who are culturally competent. 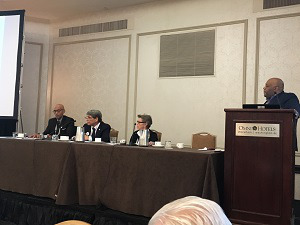 That was a key takeaway from a panel discussion Friday at the 58th annual meeting of the Council of Graduate Schools. Hosted by Education Testing Service and moderated by Diverse Executive Editor Dr. Jamal Eric Watson, “Diversity in Graduate Education: Looking At, and Beyond, Admissions” explored how graduate schools can increase diversity and inclusion by effectively recruiting and retaining students from underrepresented groups. It followed a webinar on the topic last month and provided some additional insights. Both recruitment activities and retention efforts need to be in place to make a lasting difference, said panelist Dr. Mark J.T. Smith, dean of the graduate school and senior vice provost for academic affairs at The University of Texas at Austin. A comprehensive diversity and inclusion action plan crafted with input from the entire campus community, as well as bias training for administrators, faculty and staff, is important, panelists agreed. “Accountability built in is critical if you are going to be successful,” Smith said. Faculty who have demonstrated passion about diversity can be effective facilitators of discussions on campus about the rationale for increasing diversity, said Smith. A good starting point, he added, is campus climate surveys. It’s likely that every campus has diversity champions who can help lead through discussion and into concrete action, suggested panelist Dr. Steve W. Matson, dean of the graduate school at the University of North Carolina at Chapel Hill. Nurturing strong connections with faculty at partner schools, particularly minority serving institutions and historically Black colleges and universities, can benefit diversity efforts by easing student transition from undergraduate to graduate programs, said panelist Dr. Karen P. DePauw, vice president and dean for graduate education at Virginia Tech. “It’s all about building inclusive communities,” she said. While a few graduate schools have deemphasized and in some cases eliminated Graduate Record Exam scores, doing so may eliminate useful and objective information that should be part of many factors weighed when considering students for acceptance, said Smith. Admissions colleges at some schools are so meticulous about identifying diverse students that they interview every applicant. While that may be impractical for some institutions – most have an admissions process that allows only a fraction of applicants to be interviewed – Smith said any school can devise effective recruitment practices that fit their respective campus cultures. Smith said the diversified student population at his graduate school, at which no ethnic group is a majority, considers race among many other factors in building a student body and producing graduates with cultural competencies. The philosophy is similar at Virginia Tech, where the admissions application goes well beyond grades and test scores into areas such as research, leadership, ethics, service and overcoming barriers, DePauw said. Along with ETS’ Personal Potential Index tool, an exhaustive application questionnaire helps with a more holistic evaluation of a prospective student, she said. At UNC Chapel Hill, a similarly thorough review is done and diversity is strongly considered in a process where “nothing is being thrown away,” said Matson. When an invited student arrives to interview, he explained, faculty no longer get that student’s application packet beforehand, “which has changed the conversation” in a meaningful way. Now, Matson said, visible diversity in recent cohorts has risen from 10 percent to 30 percent – and there is no statistical difference between the completion rates of underrepresented students in the Diversity and Student Success Program (DSS) and the general grad school population. Intentionality is vital to achieving diversity and inclusion, Matson said, describing the DSS and its numerous initiatives designed to promote retention and degree completion among underrepresented students. With options ranging from Global Grads to Carolina Grad Student F1RSTS, students can participate in as many community-building groups as they like. Panelists cited several hurdles that can stand between a graduate school and a diverse and inclusive student body, including inadequate finances, faculty reluctance and general campus culture. One way to address the challenge of getting faculty to move from a stated commitment to diversity to passion about working toward it is to reward diversity-promoting efforts, said Smith. Diversity goals can’t be achieved without faculty support, said DePauw. At Virginia Tech, she said the faculty senate is engaged, inclusion is stressed at the department and program levels, bias workshops are presented and inclusive pedagogical approaches are encouraged as part of a broad and deep approach to diversity. A critical thing for graduate schools to remember about cultivating a diverse student body is that they have to start somewhere “and make a commitment to continue,” said Matson.